Daily brushing and flossing can generally keep the area just beneath the gums clean and free of bacterial plaque. If allowed to remain on the teeth for more than 24 hours, bacterial plaque begins to solidify into calculus, which adheres strongly to the side of the teeth. Scaling will be required to clean the calculus deposits. Note: in the figure, the gums were retracted for clarity to show the sub gingival (below the gums) calculus. When bacterial plaque remains on the teeth for more than 24 hours, the plaque begins to solidify into a hard substance called calculus, which adheres strongly to the side of the teeth. If the presence of bacteria is continuous, chronic inflammation occurs and the gums begin to swell with fluid. This can cause a loss of periodontal attachment fibers, which is an indication of early active periodontitis. Scaling and root planing are terms most often used together to describe a non-surgical periodontal procedure for the treatment of early to moderate periodontal disease (periodontitis). A cross section of two teeth, showing the gums in the center. The area circled in orange is the area shown in greater detail in the following figures. 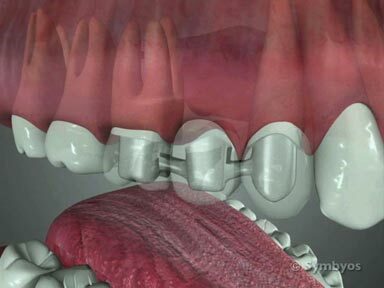 Scaling and root planing is a procedure in which dentists or dental hygienists use sharp, specialized hand instruments known as “curettes” to scrape (scale) mineralized calculus deposits from the cementum surface of tooth roots, into which the attachment fibers of the gums and periodontal ligament previously inserted. When the deposits are removed (debridement), the cementum surface is planed smooth to make it less supportive to bacterial colony formation. The area circled in orange shows the periodontal attachment fibers, which hold the gums in place against the tooth roots; and the teeth in place in the jaw bones. If a diagnosis of generalized periodontal disease has been made, scaling and root planing may be needed on most or all of the teeth. If the diagnosis is localized periodontal disease, only the affected teeth are treated. Scaling and root planing is recommended for early active periodontitis when there is bleeding and gum enlargement (inflammation), a periodontal pocket of 4 to 6 millimeters in depth, and a detectable amount of mineralized calculus deposits on the teeth. Probings of 4 to 6 millimeters without detectable deposits on the teeth or inflammation does not necessarily indicate scaling and root planing. In response to the continuous presence of bacteria, chronic inflammation occurs and the gums begin to swell with fluid (red area). This can cause a loss of periodontal attachment fibers (area circled in orange). Before scaling and root planing is undertaken, it is necessary to establish a diagnosis of periodontal disease. On the date of scaling and root planing, your health history will be reviewed. You may require pre-medication with systemic antibiotics if you have prosthetic joints, prosthetic heart valves, or certain types of heart murmurs. Your physician may also recommend pre-medication if you have certain other medical conditions (for example, transplants). Due to the potential for discomfort in instrumenting tooth root surfaces, local anesthetic is typically given. Frequently, swishing or irrigation with 0.12% chlorhexidine rinse is performed prior to the procedure, to minimize the number of live bacteria in the mouth. This can help prevent development of chapping and cold sores post-operatively, and transmission of contagious bacteria or viruses to the dental professional. It can also prevent soft tissue infections from developing post-operatively. A specialized probe called an explorer is used to identify deposits of calculus and roughened cementum on the roots. The deposits are then removed, and the root surfaces are planed smooth. Large deposits of calculus can be removed from the teeth using an ultrasonic or piezoelectric scaling device. Large deposits of calculus can be removed from the teeth using an ultrasonic or piezoelectric scaling device. Use of these devices can greatly increase the efficiency of the procedure, and can significantly reduce the time necessary to perform scaling and root planing. Scaling can prevent the loss of periodontal attachment fibers. 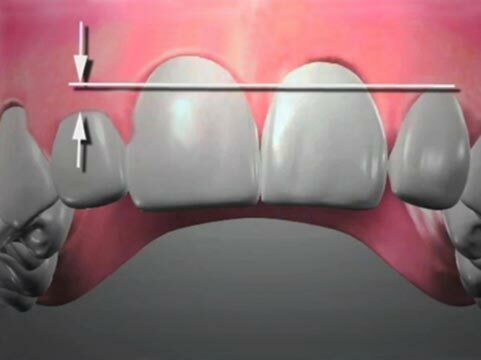 Scaling involves an upward (toward the crown of the tooth) pulling application of the curette to the deposits of calculus in order to break and cut them free of the tooth. Root planing creates a smoother root, which makes them less likely to retain plaque. Root planing is more of a rubbing motion designed to smooth the roughened root surfaces and make them less plaque-retentive. In addition to calculus removal, the goals of scaling and root planing include a reduction in the number of bacterial colonies and their food supply; and improved access for the patient, so that they can keep the affected teeth as clean as possible after treatment. If the bacteria and their food supply (plaque and calculus) are removed and kept from returning through effective oral hygiene, the body’s immune response (bleeding and enlargement of the gums) will no longer be needed to deliver disease-fighting (immune-competent) cells and compounds to the area to fight bacteria. Ironically, the body’s immune system is partly responsible for the breakdown in connective tissue that characterizes periodontal disease. Removing the problematic calculus and bacteria reduces the need for an immune response from the body, and allows healing to occur. There is controversy about whether or not use of a laser to clean the gum pockets produces better results. While early healing may be improved, it is not clear whether there is any long-term advantage. Many dentists report success with lasers in their own practices, but prospective, randomized, multi-center studies are lacking. Following scaling and root planing, your dental professional will often give specific instructions on how best to manage your unique dental situation. For example, if you have lost bone around multi-root teeth that allows food debris and bacterial plaques to build up between the roots, use of a toothpick, interdental brush, or perio aid may be recommended. When your dental professional is certain you understand how to maintain your dentition, a periodontal re-evaluation appointment should be scheduled. The periodontal re-evaluation appointment is generally set four to six weeks after the completion of scaling and root planing. At that appointment, areas which have accumulated new calculus will be identified. Areas where bleeding continues and the tissue remains enlarged are identified as sites of continued inflammation. This implies bacteria (and probably deposits of calculus) remain. Some localized refinement of the scaling and root planing may be necessary. It may also be helpful to place antibiotics below the gum level in the gum pockets around certain teeth. When a patient’s oral hygiene is observed to be effective, and no inflammation remains, periodontal pocket depths will be measured/recorded, and an appropriate interval for periodontal maintenance visits will be established. This determines how often the patient should be seen for follow up.